Based on delegate feedback from past conferences, the first half day was focused on learning with a mini Wicklander Zulawski session; WZ’s newest session in fact – Micro Expressions. Following the WZ session, RCC arranged for the first time at this event, a speed dating style “meet and greet” with exhibitors who would be presenting LP tools, solutions and resources in the networking hall the following day. In this speed dating session retailers were given 4 minutes at a table with an exhibitor, before moving on to the next one at the sound of a bell. This new session was in response to dele gate and exhibitor feedback from previous years. The response was overwhelming and both groups thoroughly enjoyed the experience; exhibitors got face time with their customer base, and delegates had the opportunity to meet many of the 32 vendors in a casual and interactive setting. Day 1 closed with a networking cocktail reception sponsored by Tyco Integrated Solutions, as well as a number of other “unofficial” sessions held in various venues in the area by Loss Prevention Solution Providers. Day 2 was an equal balance of personal development and industry research and learning. The legal session with Brian Greenspan, arguably Canada’s most prominent criminal lawyer, speaking on the laws that apply to an investigator gathering intelligence from social media was a highlight of the day and eye opening to say the least! John Sileo made quite an impact as the closing keynote speaker. His personal account of the horrors one goes through when their identity is stolen hit the mark, as retailers took many notes on how best to protect the personal information of their customers. Behind the scenes: All speaker sessions were selected by a group of retailers forming a Conference Planning Committee. Once selected, speakers had in-depth discussions with RCC staff to ensure their sessions provided key takeaways and best practices for retailers to take back to their teams. 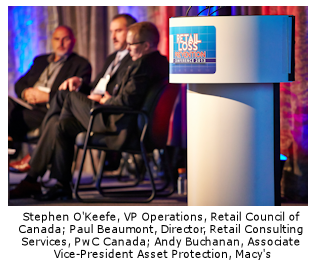 Stay tuned for more information on next year’s Retail LP Conference to be held in September 2014. 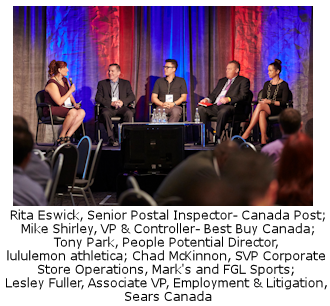 If you have any comments, feedback or topics you’d like us to consider, please send us a note at events@retailcouncil.org. We’d love to hear from you.